Immerse yourself in the snow-capped mountain wonderland of Switzerland's serene alpine setting. See the world-renowned Matterhorn, Switzerland's second-highest mountain at 4,478 m (14,962 ft) tall, or zoom down the mountains on toboggan, ski, or snowboard. In the warmer seasons, hike the rolling green hillsides covered with pine forests and picturesque aqua-blue lakes. Luxurious cities lined with cozy wooden chalets and colorful flowerbeds balance quaintness with first-class cultural offerings. Indulge in the country's opulence of milk chocolate, cheese fondue, and keg-carrying St. Bernard dogs. Swiss Alps: World-renowned for its spectacular high mountains, the Swiss Alps region is a ski- and hiking-lovers’ paradise. Canton of Bern: Home to gorgeous mountains, plateaus, waterfalls, and lakes, Canton of Bern boasts plenty of outdoors activities as well as its capital city, Bern. 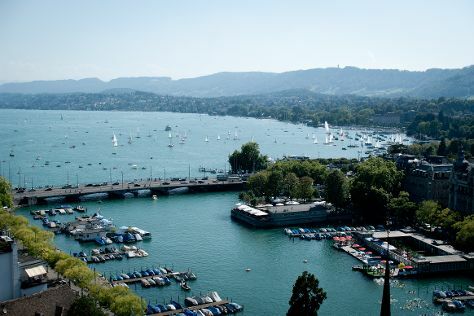 Canton of Zurich: Located at the base of the snowy Swiss Alps, Canton of Zurich draws visitors to its bustling eponymous city overlooking beautiful Lake Zurich. Canton of Vaud: Go on an igloo adventure or explore the mountain villages by hot air balloon in Vaud, a region of glaciers and valleys. Canton of Lucerne: The Canton of Lucerne is known primarily for the lakeside city of Lucerne, home to one of the oldest covered bridges in Europe and a 17th-century Jesuit church. Canton of Schaffhausen: Switzerland’s northernmost region, Canton of Schaffhausen boasts rolling hills, vineyards, and the largest waterfall in Europe. Canton of St. Gallen: Bordering Germany, Austria, and Liechtenstein, Canton of St. Gallen serves as a hub for culture and education in Europe. Canton of Fribourg: Home to the Three-Lakes Region and the snowy Pre-Alps, the Canton of Fribourg offers a mixed bag of Swiss delights. Canton of Basel: Often labeled the “Cultural Capital of Switzerland,” Canton of Basel attracts visitors with its milder climate and abundance of cultural offerings. Canton of Graubunden: Switzerland’s largest canton, Graubunden showcases everything desired from a Switzerland vacation: medieval castles, World Heritage Sites, and natural beauty. Canton of Ticino: The country’s most “Mediterranean” canton, the Italian-dominated Ticino provides a place where travelers can catch a taste of “La Dolce Vita” at espresso bars, relax at beaches, or stroll along palm tree-lined promenades. Canton of Valais: Alpine sports dominate the mountain region of Valais, home to quaint villages and luxury resort towns. Zurich: Trendy neighborhoods, natural beauty, and medieval architecture distinguish Zurich as one of Switzerland’s most prosperous cities. Lucerne: Lucerne’s well-preserved Old Town, charming mural-laden squares, and architectural monuments put it at the top of many Switzerland itineraries. Zermatt: A chic ski resort town famous for being the home to the Matterhorn Mountain, Zermatt offers the best of both winter and summer sports. Interlaken: Drawing mostly backpackers to its extreme sport attractions, Interlaken offers the best of the Swiss outdoors in one convenient location. Bern: Packed with cafes and luxury shopping arcades, Switzerland’s capital city is listed as a World Heritage Site for its sandstone architecture and world-class museums. Geneva: A veritable city of the world, Geneva boasts more international organizations than any other city in the world, but it is also renowned for its delectable chocolates and luxurious jewelry. Basel: Located at the meeting point of the Swiss, German, and French borders, Basel’s international stature is complemented by its hybrid Old Town and quality cultural scene. Lausanne: Situated alongside Lake Geneva, Lausanne is composed of distinct neighborhoods of outdoor markets, thriving art, and historical buildings. Lugano: The “Little Italy” of Switzerland, Lugano is best enjoyed through outdoor activities along the serene Lake Lugano. Lake Geneva: One of Europe’s most popular vacation destinations, the large Lake Geneva is best enjoyed by paddle steamer cruise going from one lakeside city to the next. Mt Pilatus: A steep cogwheel railway, an aerial cableway, and a panoramic gondola serve to transport visitors to the top of Mt Pilatus for a magnificent view of Lucerne and the surrounding area. Lake Lucerne: Many travelers on a Switzerland trip stop by the picturesque Lake Lucerne to see the mountain meadow on the lake’s southeastern shore--long considered the birthplace of the Swiss nation. Old Town (Altstadt): Start your tour of Zurich at the iconic Old Town (Altstadt) to see the city’s iconic bridge connecting two cathedrals as well as its well-preserved 19th-century architecture. The Geneva Water Fountain: One of Geneva’s most iconic symbols, this powerful fountain shoots water to a height of over 140 m (450 ft). Gornergrat Bahn: Experience a unique tour of Switzerland high above the Alps on the historic Gornergrat Bahn, the country’s first electric rack railway. Chateau de Chillon: This fairy-tale castle was the setting for one of poet Lord Byron’s works, and it’s one of the most popular Switzerland tourist attractions. Chapel Bridge (Kapellbrucke): Lucerne’s covered Chapel Bridge was built in the 14th century; it depicts various painted scenes from the city’s rich history. Bahnhofstrasse: Luxury clothes, jewelry, and chocolate shops line Zurich’s Bahnofstrasse, an upscale avenue stretching from the city’s central train station to the lakeshore. Dying Lion of Lucerne Monument: A centuries-old carving dedicated to Swiss soldiers lost during the French Revolution, the Dying Lion of Lucerne Monument combines somber tribute with natural beauty. Between its cosmopolitan cities and natural attractions, there are enough places to visit in Switzerland to keep both kids and adults entertained for weeks. The Swiss Alps serve as a logical starting point for those wishing to jump straight into their Swiss adventure. Aside from the dozens of mountains and ski resorts, the Alps also accommodate indoor activities. Get wet on the Caribbean-themed Aquaparc’s 1 km (0.6 mi) slide, or check out miniature versions of the country’s landmarks at Swissminiatur. Young children can enjoy the rides at Happyland, while older kids can take on the obstacle courses and ziplines at Forest Fun Park Zermatt. In the cities, zoos and museums are among the top activities for kids visiting Switzerland. Don’t miss the impressive Zoo Zürich when visiting the country’s largest city or the bears at Barenpark that gave Bern its name. Switzerland has drawn people from around the world to experience its snow-capped mountains for centuries. Even if your family has little experience skiing, a winter Switzerland itinerary is incomplete without trying your luck on one of the country’s many slopes. The Swiss Alps are certainly worthy of their reputation, but also consider the less touristy regions of Canton of Valais and Canton of Vaud. Both areas offer an assortment of excellent resort towns such as Saas-Fee and Villars-sur-Ollon. In the summer months, hiking provides one of the best ways to enjoy the Swiss countryside. Virtually every region is equipped with hiking paths, but some of the best can be found in the Canton of Schaffhausen and the Canton of Bern. If traveling extensively in Switzerland, invest in a Half-Fare Card (“Demi-Tarif” or “Halbtax”) to save 50 percent on travel tickets. Kids between the ages of 6 and 16 can also enjoy half off all travel or travel free when accompanied by a parent in possession of a Junior Card. Swiss Family Cards offer similar advantages--inquire at any train station to find the option that is most economical for you. While Swiss cuisine holds a lot in common with French, German, and Italian cooking, many authentically Swiss dishes do exist. Potatoes, meats, and cheeses are easy to find for most meals, with Swiss cheeses such as Emmental and Gruyere among the most well-known and popular. If you’re enjoying a Switzerland holiday during the winter, be sure to warm up with a cheesy fondue, named a national dish by the Swiss Cheese Union. Snack on the popular cervelet or “cervelas” sausage, and chase it down with a glass of Rivella, a carbonated milk drink. For more upscale dining, look into making a reservation at one of Zurich’s or Geneva’s Michelin-starred restaurants--indeed, Switzerland has one of the highest per-capita Michelin star-rated spots in the world. Despite a common misunderstanding, Switzerland is not a member of the European Union, and thus does not use the euro. Instead, the Swiss currency is the Swiss Franc (CHF), and prices tend to run higher than its neighboring countries. However, it’s often impossible to avoid shopping on a trip to Switzerland due to its proliferation of high-quality products. Watches are among Switzerland’s most well known exports, but can be extremely costly. Swiss chocolates are a more reasonable (and tastier) shopping option, and rival Belgium as some of the best in the world. Check out Confiserie Sprungli and Confiserie Teuscher in Zurich to find some of the very best. Switzerland has a history distinct from that of its neighbors, due to its longtime commitment to neutrality. The Swiss Confederation was established in 1291 as an alliance between several autonomous cantons. By 1499, the Swiss Confederation obtained independence from the Holy Roman Empire. Despite an attempt by Napoleonic forces to conquer Switzerland in the late 18th century, by 1815 the Congress of Vienna formally established Switzerland as an independent, neutral state. The Dying Lion of Lucerne Monument was hewn in 1821 to commemorate the Swiss Guards killed during the French Revolution--one of the country’s last military exploits. Switzerland remained neutral during both World Wars in the 20th century and was not invaded during that time. As such, Swiss buildings evaded the damage suffered by its neighbors, with national monuments such as the Chapel Bridge (Kapellbrucke) and Zurich’s Old Town (Altstadt) remaining in pristine condition to this day. In the latter half of the 20th century, Switzerland was involved in various peacekeeping and international development missions, establishing various United Nations headquarters in Geneva despite not joining the organization until 2002. While Switzerland is still not a member of the European Union, it remains active in various European organizations and the country implemented the Schengen Agreement in 2008. Swiss culture is a mixed bag of German, French, and Italian influences in a decidedly Swiss mentality. While Switzerland is a very safe country in which to travel, familiarizing yourself with certain laws and customs will ensure that your Switzerland holiday will be hassle-free. Understand that different languages predominate in different regions: German in the north and east, Italian in the south, and French in the west. Spend a moment researching the local language, and make an effort to learn a few simple words in phrases in that language. The Swiss are punctual and well-mannered. Be sure to arrive on time, and don’t ever litter--though not illegal, locals will resent you for it. One thing that is illegal is photographing somebody without his or her explicit consent. While it is possible to sight celebrities in one of Switzerland’s attractive cities or resorts, refrain from taking their photograph (or anyone else’s, for that matter,) without asking their permission first. Each of Switzerland’s cantons celebrates local holidays independently with the exception of the National Holiday, celebrated on August 1 nationwide. Some notable regional holidays include the Lenten carnival “Morgenstraich” in Basel, and the “Sechseläuten” in Zurich. The latter is observed on the third Monday of April to celebrate the end of winter by burning a snowman mannequin. If your Switzerland itinerary takes you to Bern in late November, try to catch the Zibelimärit, a traditional bad-breath market fair where onion pie, onion sausage, and onion soup is consumed. Switzerland boasts a temperate climate, which varies according to altitude. Extreme heat or cold is rare, with summers ranging from 18 to 28 degrees Celsius (65 to 82 degrees Fahrenheit) and winters ranging from -2 to 7 degrees Celsius (28 to 45 degrees Fahrenheit). Due to the variation in altitude, it’s a good idea to carry an extra sweater and/or sunscreen wherever you go. Switzerland is very well-connected, with trains, buses, and mountain transportation incorporated into a single system. The number of options and ticket types can be overwhelming, so don’t hesitate to ask for assistance at your local train station or from your hotel concierge. Planning in advance and making reservations is occasionally needed. Check out the Swiss Federal Railway’s website for more information. Driving is another great option, as roads are plentiful and well-maintained, but beware that speeding and other driving violations are strictly enforced and can result in heavy fines or arrest. As part of your Switzerland trip, you’re likely to hear a variety of languages. The country’s official languages are Swiss German, French, Italian, and the lesser-known Romansh. Swiss German predominates, which is not altogether the same as “traditional” German. When traveling, familiarize yourself with the local language. Although English is widely understood in every region, an attempt to speak a few words in the local language is greatly appreciated. Tipping is not a requirement in Switzerland. However, a small tip of 5 to 10 Swiss francs is appreciated for good service at restaurants.